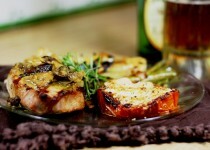 pork chops - 4 pcs. mushrooms (mix of cremini and Portobello) - 12 oz. unsalted butter, cut into pieces - 2 tbsp. chopped chervil - 2 tbsp. Heat oil in large skillet over medium heat. Working in batches, sear 2 min. each side. Remove and set aside. Add mushrooms to skillet with more oil if needed. Sauté until soft, about 3 min. Sprinkle with remaining rosemary and place chops on top. Place in oven and roast 45 minutes, turning once, or until chops are cooked and slightly pink in the centre. Remove chops and mushrooms from pan. Place skilled on medium-high heat. Add wine and Garlic Balsamic Vinegar. Bring to boil scraping up browned bits from bottom of skillet. Add stock and tomato paste and boil until mixture becomes slightly syrupy, about 5 min. Whirl in the Horseradish Garlic Condiment until blended. Stir in mushrooms and chervil. 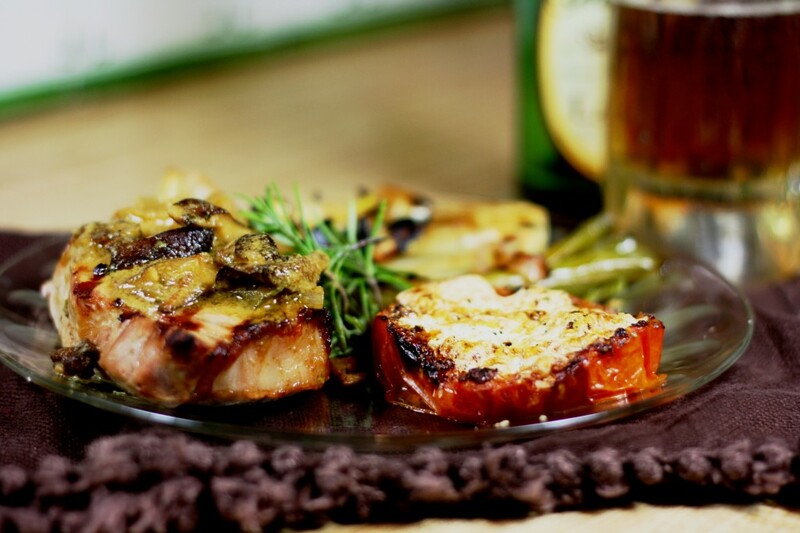 Place pork chops on plate stacked with garlic mashed potatoes. Top with mushrooms and drizzle with sauce.